TOP 2% Standard Deviation in Fleece!!!!! Double 8 Alpaca Ranch is now located in Lovettsville, VA, conveniently within an hour of Washington DC, Richmond, VA and Baltimore, MD. This is the home of Doug & Bonnie Kittrell -- as well as some of the finest alpacas in the US specializing in dark colors, especially black. We personally care for our herd daily and manage our elite breeding program. Our goal is to breed healthy alpacas with excellent fleece characteristics (fine, crimpy and dense) with a color focus of BLACK. The genetics you will find in our beautiful herd are: Legacy, Accoyo Express, Snowmass Midnight Magic (Midnight Express! ), Snowmass Nova, Caligula, Augusto, Hemingway, P3 White Lightening, Romantico (PANTHER! ), Shaquille, Bueno, Royal Fawn, etc. 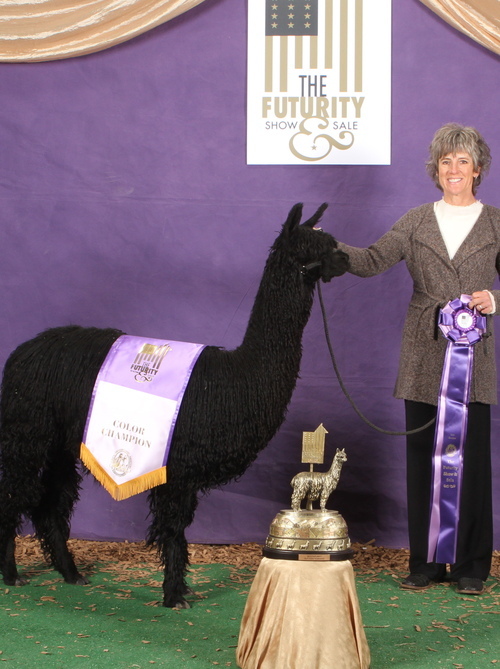 Starting in 2012, Double 8 Alpaca Ranch added an elite selection of suri alpacas to the Double 8 herd. Introducing ~ 6-Time Color Champion, WLK Milano (a Peruvian Saber & Midnight Lockdown son) and 2012 FUTURITY Black Champion, GLR Black Diamond (a Shavano daughter). The care that we provide our alpacas and the commitment to our customers is what sets us apart from most breeders. We offer endless support prior to and after the sale of any alpaca from our herd. We are proud to say that our clients are 100% satisified with our services and alpacas purchased to date. Ask for our references! We are committed to the alpaca industry as a whole. 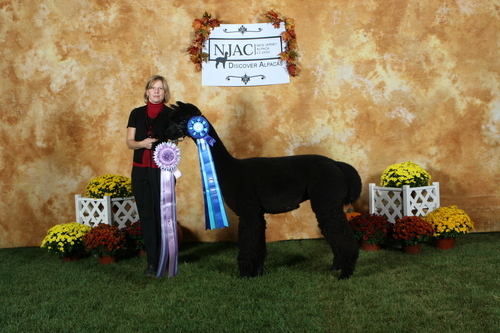 As active members of the New Jersey Alpaca Community (NJAC), we initiated and managed the first and very successful AOBA certified NJAC (New Jersey Alpaca Classic) level 3 alpaca show in 2009. 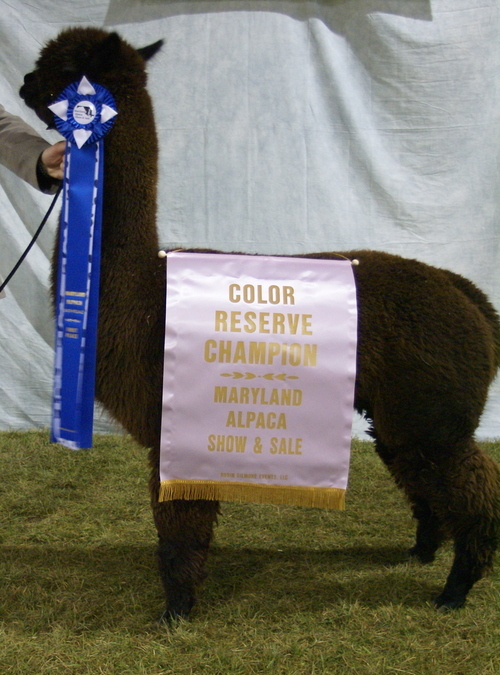 We also initiated and organized the first Eastern Alliance Alpaca Pen Sale in 2008. We are current members of AOBA, ARI, NJAC, MAPACA, and VAOBA! We also have a nice selection of all natural yarn grown by our own beautiful herd here in VA. In addition to yarn, we have scrumptious raw fleece for the hand spinner. We also have alpaca socks, gloves, hats, sweaters, scarves, alpaca loofah soaps, teddy bears and alpaca figurines that would make a beautiful gift for any occasion! Call us today to schedule a farm tour and let us show you how we have built an exciting lifestyle based on top quality alpacas, fair prices, and superior support. 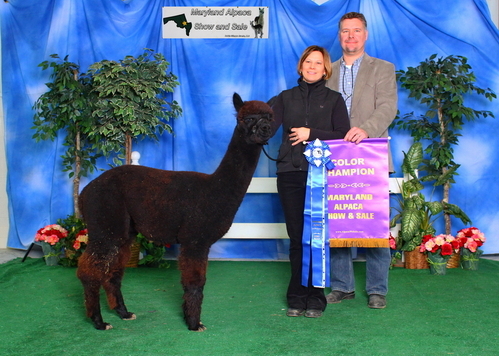 Champion Alpacas and 100% Customer Satisfaction!